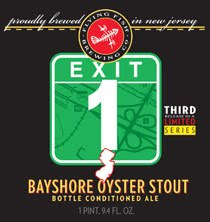 East Coast Wineries: Flying Fish - The Exit Series: Great Beer! Great Idea! Real Local! Flying Fish - The Exit Series: Great Beer! Great Idea! Real Local! I owe Joshua M. Bernstein, Josh Morvos, and Josh Woods for getting me back on track with quality ales. I started out as a home brewer, so I am beholdin' to 'em. I'll only cover local brews here from time to time....it's time. 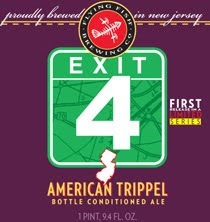 The Exit Series™ of beers is a multi-year brewing experiment to brew a series of beers as diverse as the great state of New Jersey. These big beers–in size as well as flavor–will celebrate each exit of the state-long artery that connects us. Each beer will focus on a unique aspect of an individual exit. The beers have been featured on NPR! An American Trippel kicked off the Exit Series. This inspired Belgian-style Trippel has a hazy golden hue and the aroma of citrus with hints of banana and clove. In 1682, William Evans brought his family over from Wales. Evans bought 300 acres of land at the “site of the Mount,” the hill which would later be known as Mount Laurel. In 1698 the Evans family gave the Society of Friends an acre of land. On that land they built the Friends Meeting House, which the oldest meeting house in the country and still in use today. The Township of Berlin was established via legislation on April 11, 1910. On April 26, 1927, the Borough of Berlin seceded from the Township. For the first release, they chose Exit 4--right up the street from the Flying Fish brewery. Because they were one of the first craft brewers to embrace Belgian-style beers, they've chosen as our representative beer, a Belgian trippel finished with plenty of American hops. This inspired Belgian-style Trippel has a hazy golden hue and the aroma of citrus with hints of banana and clove. Predominant Belgian malt flavors give way to a subdued bitterness in the finish. Bottle conditioned, this beer will develop as it ages. The Southern gateway to the state from Delaware. Also, home of professional wrestler Dirty Dennis Allen, so keep your Joisey comments to yourself! The area now known as Carneys Point was first bought by a Quaker, John Fenwick, from the Lenni Lenape tribe for 2 ankers of rum, 8 knives, and 3 pairs of scissors. In 1725, the area around Helm’s Cove was bought by two Irish immigrants, Thomas Carney and William Summerill, who established an estate. However, the area was not officially named Carneys Point Township until it was voted on in 1976. It was changed from Upper Penn’s Neck Township. According to legend, in July 1820 Colonel Robert G. Johnson ate a tomato in front of a horrified crowd, proving that they were not poisonous and introducing one of the area’s most important crops. In 1891, E.I. DuPont de Nemours and Company bought the 200 acre Carney estate. In the 1960’s DuPont Chamber Works was the largest chemical factory in the world. The third stop on the multi-year trip to explore New Jersey through its beer and culture takes us to Exit 1. Beer brewed with oysters. Alcohol 7.5% by Vol. 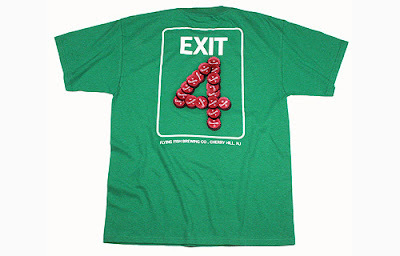 For our second release, we chose Exit 11 - the crossroads of New Jersey. So we brewed a beer that celebrates a confluence of styles. We looked to Germany and its refreshing wheat beers, but used a classic English ale yeast. A trio of Pacific Northwest hops chime in to create at 6.2% abv beer that’s quenching, yet has a bit of a bite. 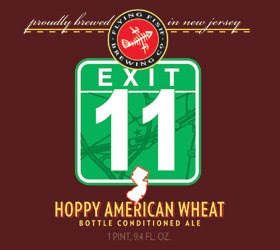 Exit 11 is brewed with 50% Belgian pale malt and 50% white wheat. It’s hopped with Columbus, Palisade and Amarillo hops. We then dry hop it with more than a pound per barrel of Amarillo hops for a bouquet reminiscent of tangerines and apricots. There are only 1,000 cases of 750ml bottles available and they start shipping this week. Once they're gone, they're gone. Great series. Great look! Great beer! Just awesome. Find some and enjoy! I Got the Last Lehigh Valley Nouveau! BOUKE' SMELLS GREAT! AND TASTES GREAT TOO!